← June to August 2014 tide predictions. Mean sea levels have continued to fall over much of the western Pacific, particularly to the north and west of Kosrae (see plot below) and it is likely that tide levels will be close to normal over the next three months. There are unlikely to be significant high tides causing coastal flooding during September and October (except if storms or large swell occurs). More significant high tide levels will begin to be experienced again in November, particularly around the 7-8 and 23-24 of November. However, these are unlikely to be as high as was experienced at this time last year. Copies of the tide calendars can also be obtained from either the KIRMA office or PACC office in Tofol. Seasonal forecasts (for next few months) for sea levels were not available at the start of September from the Pacific ENSO Applications Centre (PEAC). Rather forecasts of sea level variability over the coming months from an interactive map from the Australian Bureau of Meteorology was used. 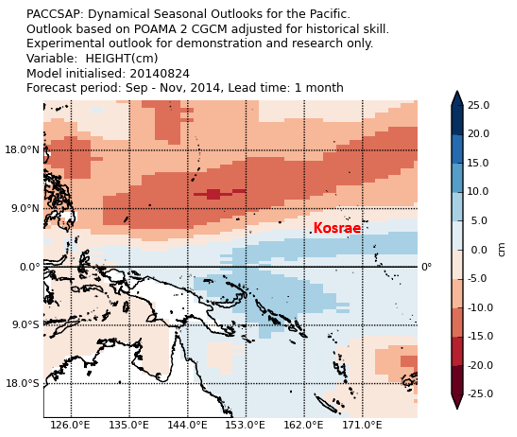 The figure below shows the sea level anomaly over the September to November period (relative to the 1981-2010 average) over the western Pacific. 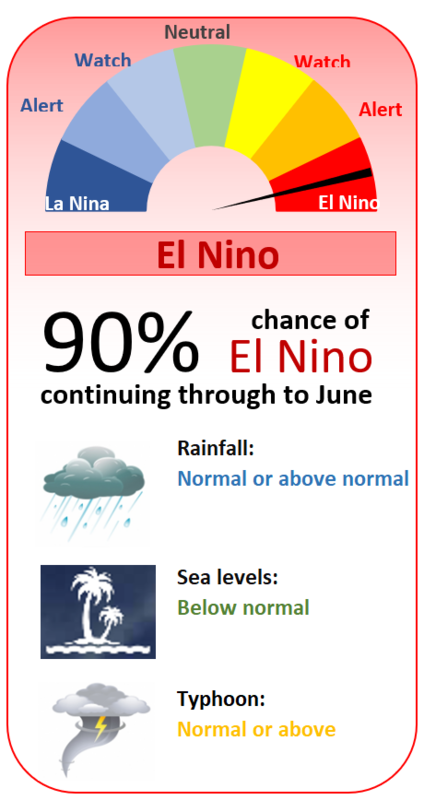 Over the next 3 months, this suggests a sea-level anomaly in the region around Kosrae of around 0 to 5 cm (0 – 2 inches) above the 1981-2010 average. This entry was posted in Coastal flooding, High tides, Seasonal forecasts, Tide tables. Bookmark the permalink.